"I can think of few books about Israel and Palestine, written by an Australian, as important as Antony Loewenstein's brave j'accuse. In challenging the propagandists to give up their addiction, he is a truth-teller bar none." "This is one of the best treatises which presents in the most lucid way possible why anti-Zionism can not be equated with anti-Semitism. 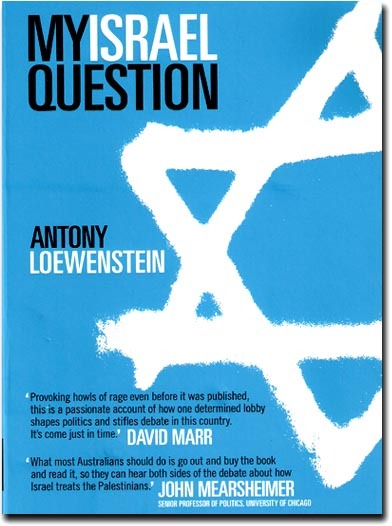 Interweaving personal trips, most valuable information and clear analysis, My Israel Question will serve as an essential guide for those who dare to criticise Zionist wrongdoing in the past and Israeli policies in the present, without being deterred by false allegations of Anti-Semitism." "Provoking howls of rage even before it was published, this is a passionate account of how one determined lobby shapes politics and stifles debate in this country. It's come just in time." "What most Australians should do is go out and buy the book and read it, so they can hear both sides of the debate about how Israel treats the Palestinians." 2. clarification that you'd like to receive My Israel Question, and the number of copies you require.